What is up for discussion? –Hot Issue in Polar Area! –Which sea areas could have contributed? –What does not explain the warming? –Which causing mechanism should be discussed? 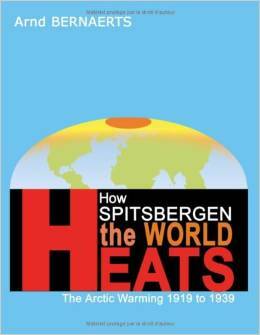 –Can WWI have caused the Spitsbergen warming? – Annex F – Air Temp. 1912-1930; North Atlantic Region. 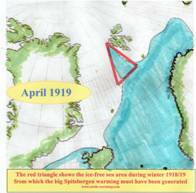 – Annex G – Annual Mean Temperatures from app.1880-1947 in the Northern Atlantic Region. – Annex H – Europe. Can the warming in the early 20th Century be explained? Missing the Point on Arctic Warming, Ø. Nordli, IPCC, NASA ? “The Arctic ocean is warming up, icebergs are growing scarcer and in some places the seals are finding the water too hot”, reported the The Washington Post, on November 2nd , 1922. B.J. Birkeland (1930) saw the temperature rise, as“probably be the greatest yet known on earth”, and few years later A. W. Ahlmann (1946) called the event a ‘climatic revolution’. This site explains this sudden warming since winter 1918/19 in a detailed step-by-step approach (Chapter A-C; Links on left-s ide). Since about the 1980th it is evident that the arctic is warming, after a colder period over four decade again. It is good that this trend receives attention since recently. IPCC has little problems to assert: The Arctic is expected to experience the greatest rates of warming compared with other world regions. However, the early warming is not explained, and the little they say is inaccurate. Other title it in this way: “NASA’s Earth scientists think ice is hot – a hot topic, that is”, but fail to explaining anything either. That is a big surprise as there are few, but reasonable data documented. Ø. Nordli, a scientist at the Norwegian Meteorological Institute, confirms the reliability of the data taken at Spitsbergen, stating: An abrupt change of temperature occurred at the end of the 1910s transforming the Svalbard climate from a cold phase (1911-1919) to a warm phase (1920-1930). Evidently Spitsbergen saw a temperature increase of more than 10 degrees Celsius from winter 1916 & 1918 to winter 1922/23 (see: Table Spitsbergen-Temp & the figure ‘Deviation’). Despite this fact, Ø.
Nordli made a statement concerning the period 1911 – 2004: “During winter (DJF) no significant trend in the data is seen, whereas in spring the trend is highly significant, 0.42 °C per decade.” It seems Ø. Nordli missed the most interesting and important point: What cause the temperatures to ‘explode’ in winter 1918/19? Also a work from Sergey V. Pisarev (1997) indicates that the impact of the sea may require more attention. Actually, this site is carefully elaborating the reasons for the sudden commencement of the arctic warming since winter 1918/19, concluding, that the source had been the seas around the Spitsbergen archipelagos as far as not covered by sea ice according the seasons. When Ø. Nordli observes: “The cold phase was characterized by clear sky and pronounced inversions, whereas the warm phase was characterized by overcast sky and weaker and rarer inversions”, the answer is easy, for the winter season at least: It is the sea. IPCC, 2007a: Climate Change 2007: The Physical Science Basis.Contribution of Working Group I to the Fourth Assessment Report of the Intergovernmental Panel on Climate Change [Solomon, S., D. Qin, M. Manning (eds.)]. Ditto: Average Arctic temperatures increased at almost twice the global average rate in the past 100 years. Arctic temperatures have high decadal variability, and a warm period was also observed from 1925 to 1945. Øyvind Nordli, 2005, „Long-term Temperature Trends and Variability at Svalbard (1911 – 2004)“, Geophysical Research Abstracts, Vol. 7, 06939, 2005. Zakharov, V.F. 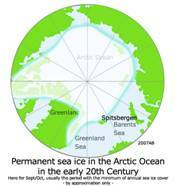 ; 1997, ‘Sea Ice in the Climate System’, Arctic Climate System Study, WMO/TD-No. 782, in the section “On the nature of ‘polar forcing’”, p. 71.